I’m sitting in our Burbank apartment, lying on our black vinyl couch for the last time. It was bequeathed to me 11 years ago by my father, after he asked if we needed any furniture for our move to California. Emphatically, yes. We didn’t have much money at the time and no jobs on the horizon. All we had were our NYU diplomas and a bit of moxie. We’d seen job listings aplenty in LA and were prepared to work for nothing to take a shot at our dreams, which, at the time, were big hazy bubbles with cinematic sparkles at the centers. Neither of us knew exactly what we wanted to do, we just knew we wanted to work in the movies. Enjoying our black vinyl couch one last time. Unbeknownst to us, our free furniture came with a price. It had all been stored in a mildew-infested basement for many years. Vacuuming, dusting, and airing out could only do so much to alleviate the odor. We spent our first year in Los Angeles wading through the scent of hand-me-downs hoping it would improve over time, and, just like our lives, it did. The smell got better and our lives got richer. We lived our dreams, worked on film sets, and promptly became flat broke, after which we mercifully landed jobs that offered paychecks instead of craft services. Needless to say, we both lost weight. As finances improved we talked about replacing our furniture. We even went so far as buying a new chair to replace the old recliner that had once belonged to my grandfather. It had been his favorite. He liked it so much, in fact, that he once repaired it by bolting a metal arm to its side. Over the years it had lost some buttons, become discolored, and now sported a jagged stitch along its arm. It was the Frankenstein of armchairs. But, as Katie and I sat in it together for the last time, my body curled up on hers, we couldn’t let it go. Grandpa was right. It was too cozy to throw away. So, hideous as it was, we kept it. 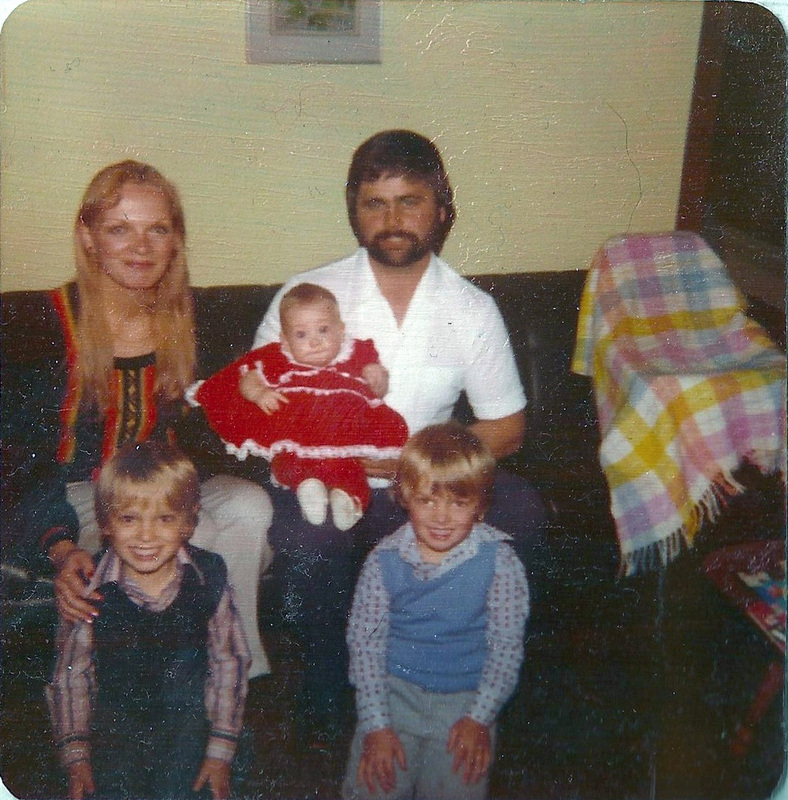 My family, circa 1978, sitting on our beloved black vinyl couch. One day I happened upon a kindergarten project of mine that had managed to survive over the years by being tucked here, there, and everywhere, until it had finally found itself tucked into the back of our closet. “Things I Like,” was scrawled at the top, and below those words were pictures of Halloween, a birthday card, dancing shoes, the A-Team, and (surprise, surprise) ice cream. Then, in black boxy letters I'd written, “My Family.” They all stared back at me: my two big brothers kneeling on the ground, my beautiful mother smiling behind them, my handsome father holding me on his lap, and me, as a baby, mugging it up for the camera (some things never change). Then I noticed the couch: black, vinyl, with square-patterned cushions and buttons at the cross-stitch. Our couch! It had survived our childhood, been thrown into a forgotten cellar, and was newly resurrected to be loved once more. Classic Hollywood. Suddenly I didn’t mind the smell so much. A year and a half ago Katie’s cousin Asha came to visit us. It was the week before Christmas and she had just finished the first leg of a solo trip around the world. I was in awe of her bravery. As is my nature, I pummeled her with questions: “Where are you going? How will you get there? Aren’t you scared? What about food, water, disease…?” Her answers were straightforward and without fear. She was emboldened by how far she’d already come and excited for the future. And just like that, a door opened. “We could do that,” Katie and I found ourselves whispering in the days that followed. The ruminations began like delicate steps on a frozen lake. We’d never considered something like this before. Leaving everything behind to travel for a year? It seemed amazing, impulsive, crazy... Could we do it? Yes. Should we do it? That answer was a bit more complicated. Katie and I considered our fictional home that we were no closer to buying. The truth was, we were scared about locking ourselves in. A home meant a mortgage, which meant working, working, working. But going on a trip around the world would mean putting a house and a family on hold. The clock was already ticking. We aren’t getting any younger, we fretted, but then again, we aren’t getting any younger. We knew that if we wanted to do a trip like this, where we’d be living out of our backpacks hoofin’ it across globe day in and day out, then we had to do it now. You never know what life has in store for you. We could die tomorrow, so why not live today? Besides, retirement may not be kind to us, and mountains don’t adjust their scale based on age range. Those thoughts were tossed back and forth for months. We pro/conned it like a game of tic-tac-toe. Backpacking around the world wasn’t something we’d ever considered before, but we knew we needed a change, we needed to change, otherwise we could lose ourselves. Time goes by so quickly you don’t know you’re unhappy until you are, and I didn’t want that to happen to us. So the coulds turned into shoulds, and the ifs turned into whens, and before we knew it we were planning a trip around the world. The months have both dragged and flown by since we made our decision. There’s been researching, note taking, calling, booking, pills, injections, TONS of lists – and that’s been the easy part! The hardest part has been saying goodbye. In these last closing weeks we’ve ridden a roller coaster of emotion, feeling our stomachs turn at every high and low. Fear. Excitement. Trepidation. Joy. Worry. Love. Everything’s happening at once, and though it can be unpleasant at times, we certainly feel alive! “When we get a house” has now become “When we go on our trip,” and I haven’t mourned our imaginary home for a second. It can wait for us, somewhere in the future. Instead, we’ll be trading our black vinyl couch in for a pair of backpacks. Posted in Trip Prep and tagged with Trip Prep. June 30, 2013 by Alice Taylor.